Be the first on your block to be a WAA Certified Web Analyst. Be part of an exclusive group that will take the exam at eMetrics San Jose. Click here to register now! If you have purchased a day-long or longer full conference pass to either eMetrics or the parallel Conversion Conference, we invite you to join us for Conversion Bash - the official party of the event. Click on a thumbnail to view a video message. Show us the ROI! This is where the ROI is measured. 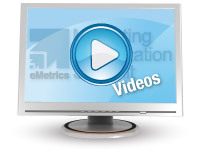 Watch sessions from past eMetrics at Online-Behavior. 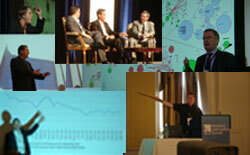 The eMetrics Marketing Optimization Summit is an important, game changing event for you and your company. It can help you become more relevant and valuable to your organization and put you head and shoulders above your competitors. Optimizing your marketing is no longer a personal challenge, it is a corporate imperative. Bring back knowledge about marketing optimization, web intelligence and social media metrics and make 2010 surpass all expectations. Marketing professionals come away from the eMetrics Marketing Optimization Summit with their eyes glowing and their notebooks filled. Garner new ideas and specific, practical implementation tips. Check out the speakers, review the agenda, Google the blogs, and see why the analysis of the data you already have and the eMetrics Marketing Optimization Summit are the keys to increasing revenue, lowering costs and improving customer satisfaction.